What do sensitive documents and breast cancer have in common? Both must be destroyed. 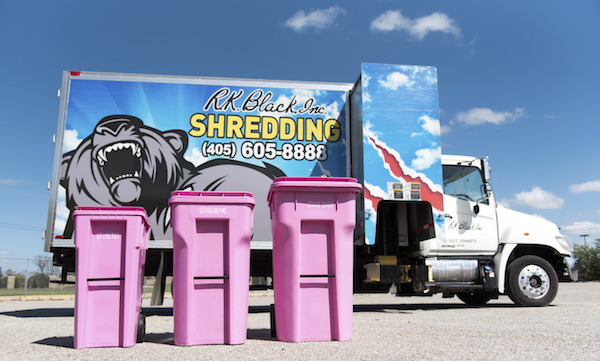 That’s why for more than two years, R.K. Black Shredding has partnered with Susan G. Komen of Central and Western Oklahoma to raise funds to help fight breast cancer and to increase breast cancer awareness. Since program's beginning, with the help of our shredding clients, R.K. Black Shredding has been able raise more than $3,000 toward stamping out this disease that has affected so many lives. Naturally, we want to increase the amount raised to put even a greater dent in the disease and to reduce the number of its victims. As October is Breast Cancer Awareness month, we want to remind you and, well, any business needing document shredding in the central Oklahoma, that you too can join this alliance against breast cancer. You can help shred breast cancer by shredding your documents under our "Shred for a Cure" prorgam. If you need document shredding services and want to join the fight, simply ask to be part of our program. We’ll provide you with a pink bin instead of or usual gray bin, confirming your commitment and your support to save lives. All you have to do is fill the bin with your papers slated for destruction. Once it's full, we’ll empty it. Each time we service the bin, $5 of your service fee will go to the local Susan G. Komen chapter, and R.K. Black Shredding will match that with another $5. That means that every time you fill a bin and we empty it, $10 goes to fight breast cancer. What’s more? Your monthly invoice for our document destruction services will reflect your donation, allowing you to report it as a tax-deductible charitable donation. It’s a win-win-win! Under the program, you get to protect your confidential information, fight breast cancer and save yourself some money at tax time, all with one tip of a pink shredding bin. You’ll find the brightly-colored pink shred bin is a great conversation starter and an excellent opportunity for you to help spread breast cancer awareness. That on it’s own helps to combat the disease. So if you want to join the fight, click the red "Get more info" button below and tell us you want to part of our "Shred for a Cure" program. One of our representatives will reach out to you and get you set up with a pink bin right away.